Enjoyable in places and very pretty, but sadly blighted by sloppy design, terrible boss battles, and a lack of new ideas. In Arkham Origins we join Batman in his angsty teenage years. He's not the stoic, Kevin Conroy-voiced Batman of Asylum and City, who calmly asks criminals to turn themselves in before he beats them up, but a hot-headed, teeth-baring vigilante who punches first and asks questions later. It's an interesting twist on the Arkham formula, but only in terms of story. Despite the change of tone and time period, this is a disappointingly timid retread of Rocksteady's games. It's Christmas Eve, and skull-faced mobster Black Mask has given the caped crusader an early present in the form of a $50,000,000 bounty on his head. Eight assassins have been hired to claim the prize, including A-listers Bane, Deathstroke and Killer Croc, and a parade of low-rent DC villains including Firefly and Electrocutioner. We also see Batman's first encounter with a youthful Joker, and other cameos that I won't spoil. Rest assured, you're never short of people to punch or be punched by. The setting this time is a snowbound Gotham City, long before Hugo Strange's prison makeover. There are familiar landmarks from Arkham City – the Sionis steel mill and the Wonder Tower are immediately recognisable – but the layout has changed quite a bit. The addition of a southern island, linked by an enemy-patrolled bridge that's a chore to cross, makes the city noticeably bigger than before, but it's not as visually interesting or fun to navigate. There are too many dead ends that break your flow as you're gliding, and the new island is a grey, uninspiring industrial sprawl. To compensate for the increased size, you can now fast-travel with the Batwing, but the points have to be unlocked first by hacking communications towers. Otherwise, getting around the city involves liberal use of the grapnel boost, which pings you into the air when you grapple onto something. The Riddler is back, known only to Batman as 'Enigma' at this point, and has scattered 'extortion files' (Riddler trophies, basically) around the story levels and city. Reaching some of these involves solving environmental puzzles, but none as complex as those in City. Other side missions have you defusing bombs set by masked terrorist Anarky, destroying weapon/drug caches, and intervening in street crimes. A lot of it feels like the usual open-world game filler, and it varies wildly in quality, but there is at least a generous chunk of stuff for you to do between missions. The world-building is much better indoors. Story missions include Batman infiltrating the offices of the Gotham City Police Department, the luxurious Royal Hotel, and a ship used by The Penguin to deal arms. All are nicely crafted, with the same clutter and richness of detail that pervaded Rocksteady's worlds. The level design itself doesn't match the strength of the art, however. The missions are formulaic and linear, with none of the previous games' careful pacing. There's too much fighting, and not enough exploration of those beautifully detailed environments. You feel like you're being hastily pushed between predator challenges and fights, rather than progressing organically, at your own pace. At first I thought the combat was unchanged, but the more I played, the more aware I became that it was actually worse. The controls and animations are the same, but the tempo is all wrong. Rocksteady's original system was influenced by rhythm action games, the enemies attacking almost to a beat. But in Origins, their attack patterns are more sporadic, which has destroyed that precise, rhythmic flow. It's like a bad cover version of a great song, by a band that keeps inexplicably slowing down and speeding up. It's recognisable, but it's not quite right. A new feature I do like is the Devil May Cry-inspired rating system. After each fight, the amount of XP you're awarded is dictated by your performance. If you used a lot of variety, mixing gadgets and combos, you'll earn more, and get a better overall rating. The same system applies to predator challenges, where you're rewarded for using the environment in interesting ways. Then there are the boss battles. Oh, the boss battles. Facing off against this shopping list of famous Batman baddies should have been a highlight, but they're probably the worst thing in the game. Most involve learning and exploiting a handful of very basic patterns, while regular enemies are occasionally thrown into the arena in a half-hearted attempt to add variety. They're frustrating, repetitive, attritional slogs, and I felt a pang of dread whenever one of the assassins showed up. To be fair, with the exception of that brilliant Mr Freeze battle in City, Rocksteady's bosses were rubbish too. That's not to say there's no new content in here at all. The detective mode has been reworked, enabling you to reconstruct crime scenes with shimmering holograms, and 'scrub' through them to hunt for clues. It looks great, but is actually pretty shallow. Even with all these theatrics, you're still just holding a button to scan things. As you rewind and fast-forward through the reconstruction, red markers will appear at set points, which you then scan to reveal clues. Batman does the detecting; you just tell him where to look. A wasted opportunity, but a welcome break from all the punching, just the same. They've added multiplayer too, which has been developed by Splash Damage of Wolfenstein: Enemy Territory fame. This sees two three-man teams of Bane and Joker's thugs battling each other while a third team, Batman and Robin, try to take them out. The thugs fight over Battlefield-style control points, and can call upon Bane and The Joker to help out. It's enjoyable enough, and the predator system works well against real players, but after only a few hours I don't feel any urge to return to it. Additionally, some new gadgets join old favourites like the grapnel and batclaw. 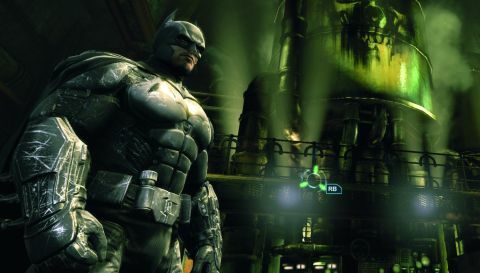 The shock gloves, which Batman pinches from Electrocutioner, can be used in combat to deal extra damage, as well as charge up generators to open doors. They only make your strikes slightly more powerful, but zapping enemies with electrified punches is really satisfying. It's never really explained why Batman has access to gadgets he only first started using in Asylum and City, though. You'll just have to suspend your disbelief. The best thing Origins has in its utility belt is the story. It's nothing we haven't seen in a thousand Batman films, games and comics before, but it's confidently written and mostly well-acted, and takes influence from established mythology without completely copying it. A standout sequence gives us a chilling glimpse inside the mind of The Joker, and elsewhere Batman and Alfred clash over the former's increasing anger and recklessness. You'll see one early twist coming a mile away, but otherwise, it's a solid Batman yarn. As PC Gamer goes to press, a player-compiled list of bugs on the Steam forums continues to grow, some of which even corrupt saves or halt progress. Few releases are without teething problems at launch, but the sheer volume present here suggests Warner Bros. have released an unfinished game, with the intention of patching it later. One bug seemingly isolated to the PC version trapped me in a room with no way to leave, and I had to use another bug to bypass it. Ridiculous. It does look incredibly handsome on PC, though. Batman's DirectX 11-powered cape flutters in the wind wonderfully, and he carves tracks through the powdery snow as he walks across it. Rocksteady's solid foundations mean that, despite all these problems, Arkham Origins is still fundamentally playable. Stalking enemies from the shadows, stringing them up on gargoyles, and watching them cower together in fear as you pick them off one by one is still brilliantly empowering. But this is the worst kind of play-it-safe sequel, and makes no meaningful attempt to push the series forward. The leap from Asylum to City was dramatic, if not entirely successful, but Origins is so similar to City – even repeating some moments verbatim – that it feels more like an elaborate expansion than a proper sequel. It's obvious Warner Bros. wanted another Batman game on the shelves while Rocksteady worked on the next one, which makes the whole thing feel a bit cynical. Yearly sequels can bleed a great concept dry, and the Arkham series deserves better.